Dr. Thanos Paraschos is an internationally acclaimed obstetrician and gynaecologist, specialized in infertility treatments. He was privileged to be a member of the team performing the first preimplantation genetic diagnosis in the world (1989), alongside with Lord Professor Robert Winston and A.H. Handyside at the Hammersmith Hospital. 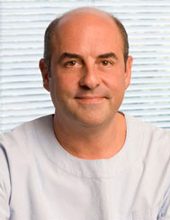 He is the medical director of EmBIO IVF Clinic in Athens, Greece, which he founded in 1996. Working in Robert Winston’s team, Thanos Paraschos invented the Rigid Wallace Catheter, used ever since by thousands of scientists worldwide for particularly demanding embryo transfers. His thorough involvement in medical research on fertility and assisted reproduction technologies comprises important medical publications published in peer-reviewed medical journals. The impact of Dr Paraschos' research οn the scientific community is manifested in the vast number of related citations of his studies by thousands of human reproduction and genetic scientists. Contact Dr Paraschos today for a FREE initial consultation!